Prequels, sequels, and remakes. It seems that there is no end in sight to Hollywood’s trend of churning out prequels, sequels, and remakes. Even the biopics and “based on actual events” flicks that were once so prevalent have largely taken a back seat to all of the prequels, sequels, and remakes out there and on the way. That is not to say that they are nonexistent. But they are not as prevalent right now as the aforementioned offerings from Hollywood’s major studios. So whenever a movie that is not a prequel, sequel, or remake hits theaters it is a reason to celebrate. However in the case of Columbia Pictures’ adaptation of author R.L. Stine’s Goosebumps books and FOX Kids TV series there was not as much reason to celebrate as one might hope. That remains the case now that the movie has been released on DVD, Blu-ray, and digital platforms. The movie is a fun turn-off-your brain flick that fans of Stine’s Goosebumps franchise will enjoy. It is also a nice escape from the endless stream of prequels, sequels, and remakes being churned out by Hollywood’s major studios. But it is anything but perfect. It has its flaws. They are mainly in the story’s writing. That will be discussed shortly. Its flaws aside, it still has enough positives to make it a breath of fresh air at a time when Hollywood is polluting theaters and store shelves with its endless ocean of prequels, sequels, and remakes if only a small breath. Columbia Pictures and Sony Pictures Home Entertainment’s new take on author R.L. Stine’s Goosebumps franchise is a breath of fresh air in a seemingly endless ocean of prequels, sequels, and remakes that is drowning audiences and theaters figuratively speaking. That is thanks in large part to the movie’s writing. The writing team of Darren Lemke, Scott Alexander, and Larry Karaszewski crafted a story that does something few if any other literary-based movies do. It takes Stine’s beloved family friendly horror stories and their characters, and uses them for a story that really is a tribute to Stine and his legacy in the literary world. This is important to note first because so many other movies based on books just take said books and essentially re-imagines them. On another level it doesn’t go the comic book to screen route either. So many movies based on comic books just throw a bunch of different story arcs together from different issues to make one story. Lemke and his partners don’t go that route either. It just uses Stine’s characters and stories as the basis for a story that pays tribute to said characters and stories in its own original tale. It is a story that sees Stine (played here by Jack Black—Shallow Hal, School of Rock, Kung-Fu Panda Trilogy) having to work with his “daughter” (hint: she isn’t really his daughter. That is all that will be revealed here in terms of that) and two local boys in order to get his literary monsters back in their books. The thing is that the search for the escaped monsters is caused by one of the two boys—Zach (Dylan Minnette—R.L. Stine’s The Haunting Hour, Scandal, Lost). This is where things with the writing become a little bit dicey. The overall approach taken to Goosebumps by its trio of writers is in itself a major positive to this take on R.L. Stine’s beloved literary franchise. As positive as the trio’s approach proves to be for the movie’s presentation the script in whole suffers from having so many hands in the proverbial pot. Having so many hands in the pot led the script to develop some noticeable plot issues beginning with the story’s setup. If not for Zach and his friend Champ (who is randomly introduced only minutes ahead of the key scene) sneaking into Stine’s house in search of Stine’s “daughter” Hannah (Odeya Rush – The Odd Life of Timothy Green, The Giver, We Are What We Are) then the monsters might never have gotten free. That is because the whole chain of events was set off by Zach. And it wasn’t accidental either. If not for his impulsive behavior (brought on largely by teenage hormones) then the hunt for Stine’s monsters never would have happened. In other words Zach and company end up having to solve a problem that was caused by Zach in the first place. Sound familiar? Disney and Marvel studios used a similar plotline for its recent blockbuster sequel The Avengers: Age of Ultron. The Avengers had to stop a megalo-maniacal robot created by one of their own in that movie. I.E. they had to clean up a mess ultimately created by one of their own. Many of the classic creature features that were so popular in the 1950s and 60s also ended up centering on the American military having to stop giant mutant monsters that they created through their nuclear testing. Of course the military never told the populace that they caused the problem along the way. The Avengers 2 was very similar in this fashion and so was Goosebumps. Stine and company never make it known that Zach essentially caused the problem. So it goes without saying that Goosebumps’ core plot is anything but original. What’s more, as with those older movies, there is a giant, gaping plot hole in that the only ones that know the cause of the conflict are the ones that caused the conflict in the first place. Why are they the only ones that know? This has always been a sorely overlooked issue with monster movies. And it needs to be addressed by writers, studio heads, critics, and audiences alike. It is just one of the problems that weighs down this monster movie, too. There is also an issue in character introduction/development that must be addressed within the movie’s script. The major issue with Goosebumps’ story is its setup. It is a setup that presents an age-old plot hole which reaches all the way back to the creature features of the 1950s and 60s. It’s just one of the problems that weighs down this script. Another major problem with this movie’s script lies in the introduction of Zach’s friend Champ (Ryan Lee – Super 8, This Is 40, Trophy Wife). Zach is randomly introduced in a school assembly scene about a quarter of the way through the movie. This comes after Zach had told his mother Gale (played by Amy Ryan – Birdman, Gone Baby Gone, Escape Plan) that he didn’t want anyone knowing that he was the new kid at the school where Gale was the new vice principal. Now if he didn’t want anyone knowing he was the new kid, how did Champ know at the assembly that Zach was the new kid? There was no background offered on this within the context of the movie’s script or in any bonus material. That makes this very much a problematic plot hole especially being that the two just happen to get along and cause the very problem which sets up the movie’s central story line. Again, it is just one more of so many problems presented in the movie’s script. There is one more problem—a dual-part problem—that must be addressed. That problem lies in the relationship between Zach and Hannah. The central story line behind Goosebumps’ and the random introduction of Champ into the story are in themselves a couple of very problematic issues with the movie’s script. They are not the only issues that the movie’s script presents either. The relationship between Zach and Hannah is one more problem that must be addressed. That is because it actually presents three major issues that cannot be overlooked. The first problem lies in the pair’s relationship. The high school, puppy-love scenario is anything but original in the horror movie genre. The boy next door falling for the girl next door, who is herself in grave danger is one of the most overly used story elements in the world of horror movies. In other words, it is yet another unoriginal aspect thrown into the movie. Moving forward in the script, the story’s final scene presents its own problem. The scene in question won’t be revealed for the sake of those that have yet to see the movie. But needless to say it plays back into a statement made by Hannah earlier in the movie in regards to her revelation about her identity. Considering the revelation and that final scene it essentially negates everything that had developed between the pair. This includes the related issue of Zach even searching for Hannah early on when he thought something had happened to her. Since she was obviously in the house when he and Champ went looking for her, how could she have not heard them in the basement in the first place? Why did it take Zach and Champ getting into Stine’s study for her to find them? One would think that this would have been addressed before script went to screen. If she had stopped them early on they might have never made it to Stine’s study and in turn caused the problem that led to the movie’s central story. It all comes full circle. And being all tied together, all of the noted issues with the movie’s scripting show why three heads are not better than two and for that matter that two heads are not better than one. Luckily for viewers, for all of the script’s problems those problems don’t make Goosebumps entirely unwatchable. The movie’s special effects department does its part to make the movie watchable as do some of the cast members. There are a number of problems with Goosebumps in regards to its script, as noted. As a matter of fact there are even more problems than just the trio that are listed here. For all of the problems posed by the movie’s script, they are not enough to make the movie a total loss. There actually are some positives other than just the writers’ overall approach to the movie. Another of those positives is the work of the movie’s special effects department. The special effects department is to be applauded for its work in bringing to life Stine’s monsters. From Slappy the dummy to the abominable snowman to the giant praying mantis and the evil gnomes every one of the monsters resurrected for this movie look outstanding. It is obvious that they are computer generated. But even in being computer generated those behind their creation went to painstaking efforts to make them not look like just another bunch of computer generated creatures. To a certain point their design throws back to the monsters of the old creature features from the 1950s and 60s. This is especially the case with the blob and the mantis. It is obvious not just in their design but in how they move, too. Little elements like that make them all the more believable and enjoyable to watch as they wreak havoc on the town. Being so believable makes them all the more enjoyable to watch, yet again exhibiting why the work of the movie’s special effects department proves to be so important to Goosebumps’ presentation. It is not the last notable positive involved in this movie. The cast’s work in front of the camera is just as notable as that of the special effects department. 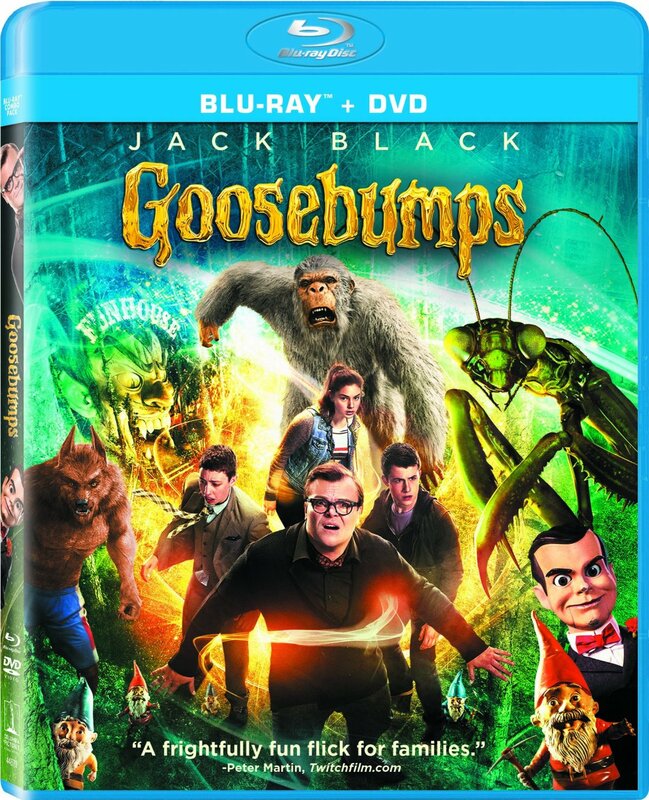 The approach taken to Goosebumps in regards to its overall story and the work of the movie’s special effects department are both key to the movie’s presentation. While both elements are important in their own right to the movie’s presentation they are not the only notable positives. The work of the cast is just as notable as the movie’s other positives. This is especially the case with Jack Black. Black is billed as the movie’s lead. But in watching the movie he is in reality more of a supporting character even playing the famed children’s horror author. The lead roles belong to his younger counterparts. Black shows throughout that he understands this and never tries to take over any of the scenes, opting instead to let his younger cohorts have their time in the spotlight. What’s more audiences will note that the buffoonery for which he is commonly known is nearly nonexistent in his portrayal of Stine. That is not to say that he doesn’t have a few moments in which that side of him comes out. But even when they do they are few and far between. Rather Black takes his experience and centers it in a way that gives his humor a drier, more focused presentation. For those that have ever seen the real life R.L. Stine interview, this means that Black’s portrayal of Stine is pretty close even with his occasional moments of goofiness. On a related note Ryan Scott Lee is just as entertaining as Champ. In all honesty it could be argued that he actually outshines Minnette with his portrayal of the high-strung and somewhat neurotic Champ. One can’t help but laugh as he pleads with Minnette about going into Stine’s basement versus being Zach’s lookout. He easily could have hammed it up in this moment. But instead he nailed the moment. And when he saves the girl from the werewolf later in the movie his momentary hesitance, while small, shows great character growth. For that he is to be applauded just as much. Of course Minnette is entertaining in his own right as he plays the hormonally challenged Zach. Audiences won’t be able to help but laugh at his portrayal at least somewhat because of the number of male leads that have been so much like Zach in other horror movies. Minnette never overdoes it in his portrayal. But he does just enough to make it clear that he is poking some fun at those male characters. His work is just one more way in which the work of Goosebumps’ cast proves to be just as important to the movie as that of the movie’s special effects department and its writers for their overall approach to the story. Even with the number of problems with the movie’s script the overall approach to the story still sits as a key element to the movie’s presentation. And together with the work of those both in front of and behind the camera the movie proves in whole to be good, spooky fun for the whole family. Sony Pictures Home Entertainment and Columbia Pictures’ new Goosebumps feature is an interesting new take of R.L. Stine’s literary franchise. That is because it presents an approach unlike most other movies based on literary works. Yes, it presents a number of problems in its scripting. But luckily those problems, while glaring, are not enough to make the movie completely unwatchable. That is because the work of the movie’s cast and its special effects makes up for the script’s various problems. In the end the movie proves that while it might have flopped at the box office (it hemorrhaged money right from the get go in terms of ticket sales, and only got worse from there) it is still a movie that anyone familiar with the Goosebumps franchise will agree is good, spooky fun that is worth at least one watch if no more. It is available now in stores and online on DVD and Blu-ray/DVD combo pack. This entry was posted in Celebrities, DvD's and blu-rays, Internet, Movies and tagged Amy Ryan, celebrities, Columbia Pictures, Dylan Minnette, entertainment, facebook, Goosebumps, internet, Jack Black, movies, Odeya Rush, Phils Picks, R.L. Stine, Ryan Scott Lee, Sony Pictures Home Entertainment, Wordpress by philspicks. Bookmark the permalink.